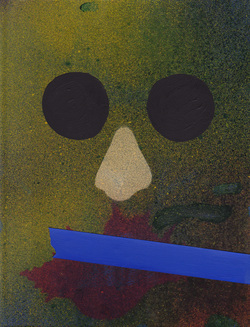 Janet Kurnatowski Gallery is pleased to present “Notable Henchmen,” curated by Geoff Young. The artists in the show are Donald Baechler, Mel Bochner, Morgan Bulkeley, Kirsten Deirup, Carroll Dunham, Warren Isensee, Philip Knoll, James Siena, Nichole Van Beek & Justin Valdes. Since1980 until last week, Geoffrey Young has asked artists to supply him with drawings for his books of poetry. For four weekends in July, these drawings and books will be shown at Janet Kurnatowski Gallery. The gallery will gather together for the first time this disparate but engaging selection of works on paper by artists whose individual feeling for graphic space (touch, line, color, composition, wit, beauty) keeps their work consistently refreshing. Not collaboration, exactly, though in some cases works were made in response to specific writings. Juxtaposition, like-mindedness & non-sequitor are more like it. Holding two things in mind, and seeing what happens. Young provides the words— short poems, sonnets, prose blocks, memoir, long poems—and these amazing artists provide the visuals. Hung salon-style in clumps and grids, these works on paper will turn the gallery into an echo-chamber, a concatenation of optical good cheer, retinal high-jinx, sophisticated thinking. Young is the author of many books of poetry, an amateur maker of colorful drawings, as well as the director of Geoffrey Young Gallery, in Great Barrington, Mass, for the last 20 years. For more information please contact Janet Kurnatowski.